Hard water is a deceiving term… because if the water were hard it would be ice. Rather, it’s a term for water that contains a certain amount of minerals or bacteria or both. The picture on the right is obviously a cross-section of pipe that has severe hard water build up in it. This is what happens to your plumbing when hard water is left untreated. This lime scale will attach itself to more than just pipes though. Over time it will ruin your water appliances like the hot water tank, the ice maker, the dishwasher, and so on. On the right is another cross-section photo of hard water build up. Notice how this 3/4 inch inside diameter pipe is now more like 1/2 inch inside diameter due to the scale. When treated with a set of our softeners, many of the hard water characteristics are reduced or eliminated. Not only is the scale build up halted, but the process of removing the scale begins. 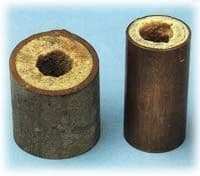 The photo to the right is an example of what a pipe can look like on the inside after a year or more of magnetic water treatment. Hard water… What is it? As stated above, we use the term hard water when there are enough minerals and/or bacteria in groundwater. How do I find out if my area has hard water? You can ask your local water company if you have one, and don’t be able to tell you almost exactly what the makeup of the water is at your home. If you have a well and if you don’t know the hardness level you can get a test kit to find out. Why should I use magnetic water softeners? For us the answer is easy… they don’t use any power and they don’t pollute the environment, and they last more than 100 years. Oh yeah, it’s easy to take them with you when you move. We have the best return policy in the industry! Take up to a full year to decide if you are happy with the results. If you are not pleased (for any reason) just send them back for a full refund, no questions asked, no restocking fee, no return authorization, and they don’t have to be in like new condition. We treat you the way we would like to be treated. Yes we can, on a case by case basis. Email us your address and we will get back to you with a shipping quote which you will need to pay if you want to proceed. We have shipped units to many countries overseas. Of course! We have been doing this for over 20 years and are happy to answer questions and discuss your specific situation. Call us 8am to 7pm Monday – Saturday (Pacific Time).